People who know me and know what I look for in horror movies say that I’m way too critical and demanding of them. Maybe so. But I’ve never been one of those who excuse the downright stupidity of the majority of horror movies simply because my friends say I’m supposed to turn off my brain and stop thinking while watching. The best horror movies and the ones I enjoy the most are the ones that do engage my brain and encourage me to not only feel but think about what’s happening up there on the screen. The horror movies of Wes Craven are among some of my favorites. Although he has made some hideously bad movies such as “Shocker” “Vampire In Brooklyn” and “Cursed” he has also made some spectacularly good ones as well. 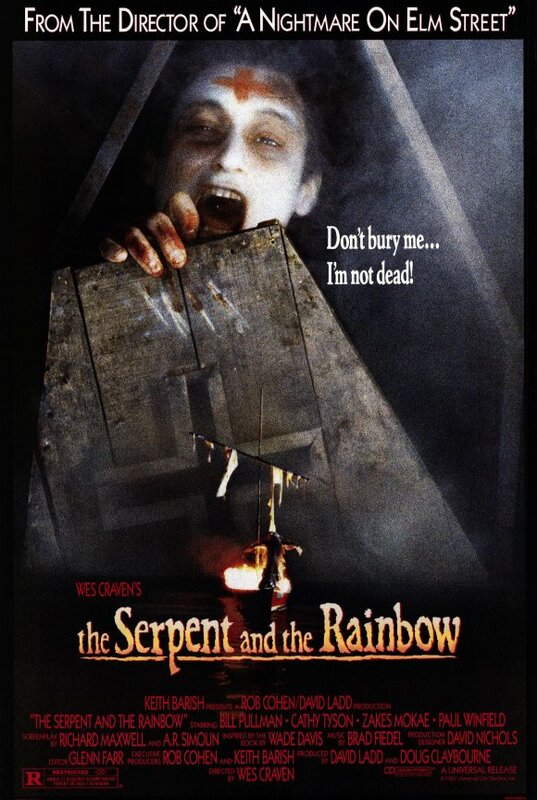 The original “Nightmare On Elm Street” “The People Under The Stairs” the “Scream” series and what is probably my favorite Wes Craven horror movie and one people just don’t mention a lot and that’s a damn shame they don’t; THE SERPENT AND THE RAINBOW. 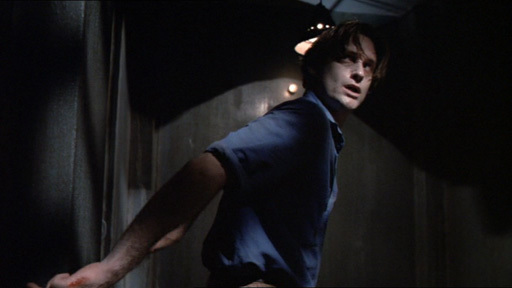 Anthropologist/Ethobotanist Dr. Dennis Alan (Bill Pullman) makes a good living going into remote jungles and coming back with rare herbs and ritual drugs from native tribes that he then sells to American pharmaceutical companies. He’s extremely good at his job which is why he’s asked to go to Haiti to investigate the voodoo society and see if there’s any truth to the myth of there being some sort of secret powder that creates zombie. Alan’s mentor Dr. Schoonbacher (Michael Gough) thinks that this could lead to the secret of where the soul is located. Andrew Cassedy (Paul Guilfoyle) the head of Boston Biocorp thinks it could be the ultimate anesthetic. Cassedy claims to have proof of a man in Haiti who was poisoned with this powder, buried alive, dug up and revived as a zombie. With the assistance of the gorgeous and brilliant Dr. Marielle Duchamp (Cathy Tyson) and voodoo priest Lucien Celine (Paul Winfield) Dr. Alan attempts to find out if this powder does exist and if zombies are actually real. His quest brings him into conflict with Dargent Peytraud (Zakes Mokae) the head of the feared Tonton Macoute who is also a voodoo practitioner of frightening power. As Dr. Allan goes deeper and deeper into the truth behind the zombie legend he has to navigate between the political unrest and civil turmoil of a Haiti ruled by ‘Baby Doc’ Duvalier and the horrendous hallucinations tearing his mind apart placed there by the power of Peytraud. Hallucinations so overwhelming that he can no longer distinguish what is real and what isn’t. There are a whole lot of reason why I love THE SERPENT AND THE RAINBOW and why I always recommend it. Along with “The People Under The Stairs” it’s one of the few horror movies with a predominantly African-American cast that is believable and treats the characters as human beings and not plot devices to be killed off to make the Caucasian heroes look good. Cathy Tyson is a wonderfully beautiful actress who isn’t in the movie just to fall in love with the hero. She has an interesting backstory of her own as well. There’s a really nice scene where Mareille talks about how she does not divide her faith and her science but makes them work together. I also like the political subtext in the movie. Set during the reign of ‘Baby Doc’ Duvalier there’s always the threat of the secret police in the background, always reminding us that not all of Dr. Alan’s enemies are supernatural. Ah, but are they? I think it’s masterful how Wes Craven plays not only with Dr. Alan’s head but ours as well, challenging us to figure out what is real and what isn’t. Is Dr. Alan hallucinating or is what is happening to him actually happening? Is Peytroud a black magician or just really good at messing with Dr. Alan’s head? THE SERPENT AND THE RAINBOW is also excellent at showing voodoo as a legitimate religion and way of life for the people of Haiti. There are a lot of scenes that are almost documentary in nature, such as the wonderful scene of a pilgrimage where a huge image of The Virgin Mary is taken to a holy grotto. Now, don’t get me wrong…I’m no expert of voodoo but I can’t think of another horror movie where voodoo is treated with the respect of it being a religion/way of life as it is here. 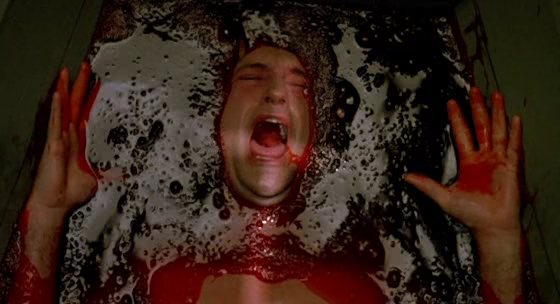 And the hallucination/dream images in THE SERPENT AND THE RAINBOW are just as good as anything Wes Craven did in his “Nightmare On Elm Street” movies. And the scene where’s he’s buried alive is without a doubt one of the most frightening in horror movie history. The acting is top notch. Bill Pullman, Cathy Tyson and Paul Winfield are all nothing less than believable. Zakes Mokae is an appropriately formidable bad guy while Theresa Merritt as a voodoo priestess and Brent Jennings as a con man who may or may not know how to make the zombie powder do solid work as supporting characters. So should you see THE SERPENT AND THE RAINBOW? Absolutely. It’s that rarest of creatures I always look for and treasure so much when I find it: a believable horror movie. The motivations of the characters make sense and they don’t act like idiots who are plainly being manipulated by a brain dead scriptwriter more concerned with his plots twists than telling a story. THE SERPENT AND THE RAINBOW makes a great double feature with “Angel Heart” in that for me, they are both horror movies in which the main character seeks the solution to a mystery that ultimately turns out to be more horrifying than the mystery itself. Great review of my favorite Craven movie and probably one of the most intelligent horror movies ever.